©UNICEF DRC/SECK/2014 New medical equipment delivered to hospitals and health centres is already being utilised to the benefit of the patients. On the road to Rutshuru, 80 km north of Goma, the capital of North Kivu, I notice a revival of life, a considerable economic recovery surely due to the growing stability in the area. Until October 2013, Rutshuru was under the yoke of the M23 armed group which had settled there during the month of May 2012. This was one of the reasons that led the government to deploy medical equipment in this area as a priority, in order to increase the pace of recovery for people living there. Today, the main highway is experiencing a constant back and forth of truck loads of merchandise and crowded bus transportation. The displaced are returning to their place of origin; new houses are being built, others rehabilitated; economic growth is reborn – a glimmer of hope is on the horizon. I went to Rutshuru, with the provincial medical inspector and a representative from the Ministry of Health, to see just how the equipment intended to equip the referral hospital as well as five health centers in the Rutshuru health zone, was being used. This batch of health equipment is part of a larger set of equipment allocations for 24 health zones, including 24 general referral hospitals and 120 health centres in the Provinces of North and South Kivu, Maniema and the Oriental Province. Each batch of equipment is comprised of: an electro-cardiograph, a universal operating table, a centrifuge, an ultrasound, 50 hospital beds with mattresses, a gynecological table, a microscope, a solar refrigerator, x-ray equipment with accessories, a general examination table, a gynecological examination table and a generator. These facilities are funded by the Government of the Democratic Republic of Congo as part of the Health Facilities Equipment Project (PESS in French) and were officially presented to the designated health facilities in March of this year by Prime Minister Augustin Matata Ponyo. On our arrival in Rutshuru, we spoke with the head doctor of the zone who gave us the inventory. Overall, the medical equipment had been delivered to the health facilities, installed and was already being used. 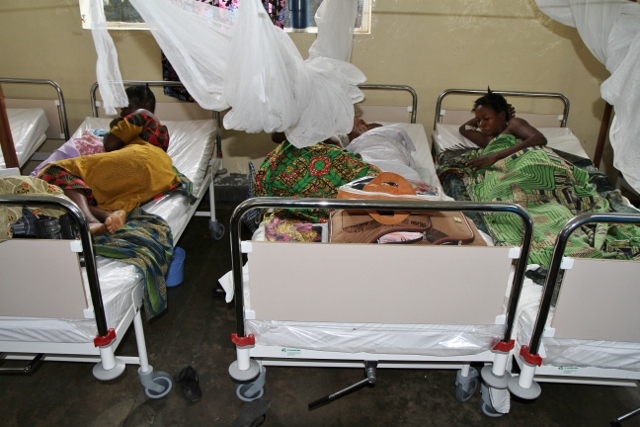 In the referral hospital in Rutshuru for example, the new beds were already part of the everyday functioning of the maternity hospital, occupied by women who had just given birth. The press and the child reporters who accompanied me also talked to them and noted their satisfaction. This UNICEF-DRC Government collaboration to equip the health facilities has a bright future ahead. Efforts by the government to get this equipment and the confidence shown in UNICEF for the purchase and delivery of the equipment to its destinations, as well as the management and monitoring of its use will be, without a doubt, to the great benefit of the people. On the way back, we also visited two health centers under construction which, once finished, will also be equipped by the Health Facilities Equipment Project. Moreover, in the context of education, the Government and UNICEF are committed in the same way to build 22 schools in Ituri. The measures taken by the DRC Government are a significant contribution to the “renewed promise” of progress by the country towards MDGs 4 and 5, which aims to save 430, 000 lives of children 0 to 5 years and 7, 900 lives of mothers by the end of 2015. This reflects the efforts made to promote the mother and child’s health as part of the approach: be born, grow, progress. Jean, it is so inspiring to see that in the midst of conflict the will and determination to transcend all obstacles to help others can be accomplished. Yeah to UNICEF! I would love to read what the child reporters have to say but the link does not work. Where did they come from and what were their observations? Keep up the great work!